Docs Story Builder is one of the lesser known Google apps, yet my students took to it immediately. It's not hard to use, although it has a quirk – editing dialogue erases whatever comes after the edit. But that didn't stop us. Students planned out the dialogues before entering them into the app. To model the expectations, my explanation for the changing views of war was done with Docs Story Builder. I framed it as a fictional, yet plausible, dialogue among three of their favorite teachers. 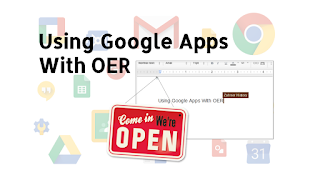 This idea all started when I realized that my students needed to build Web literacy skills, and I wasn't designing activities that supported this need. Since the next lesson was about World War I, I decided to use one of the Library of Congress exhibits that compiled firsthand accounts from soldiers in the trenches. Students chose two memoirs and made a list of facts and opinions from the first page(s) of each. The notes were analyzed for similarities and differences to provide some inspiration for a fictional, plausible dialogue. Here's my list of resources. If you know of any that you think should be on the list, add the link to the comments below and I'll check it out. 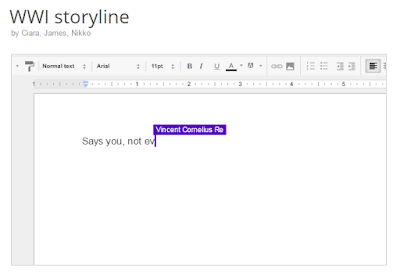 Like many Google Apps, Story Builder is intuitive and provides enough explanation to get in and out of trouble. As I mentioned above, the process can be frustrating. Planning the dialogue in advance is advised, which is a routine our students should practice, anyway. The business end of the dialogue writing is shown below. When the "write story" button is selected, it takes you to a screen to add the dialogue. This is also where music can be added by selecting the appropriate button. Please note, however, that the "add music" button must be selected to complete the story. If you choose not to add music, an option will available. Our class uses Google Drive folders to share work. I like this way of organizing workflow because it reduces the amount of times we have to share documents. 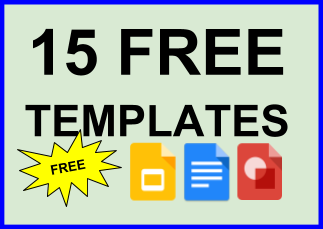 This file share folder is accessible through Google Classroom to make it even easier. 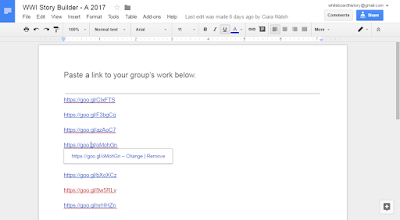 Students accessed a Google Doc to paste their link. If the link isn't saved somewhere, it's lost. The image below shows the doc with the links. I guess this could be shared via Padlet or something fancier than Docs, but I like to keep things simple and less shiny. My students will probably never forget about the conditions soldiers endured in the WWI trenches. They will also remember that trenches were WWI, not WWII. I'm confident of this because of the balance of activity that occurred during this project. They laughed and had fun writing the dialogues, which always means better learning – laughing is learning. But the best result was the routine of using the Library of Congress to access information. As the course progresses, more OER is used and more student choice and responsibility is exercised. 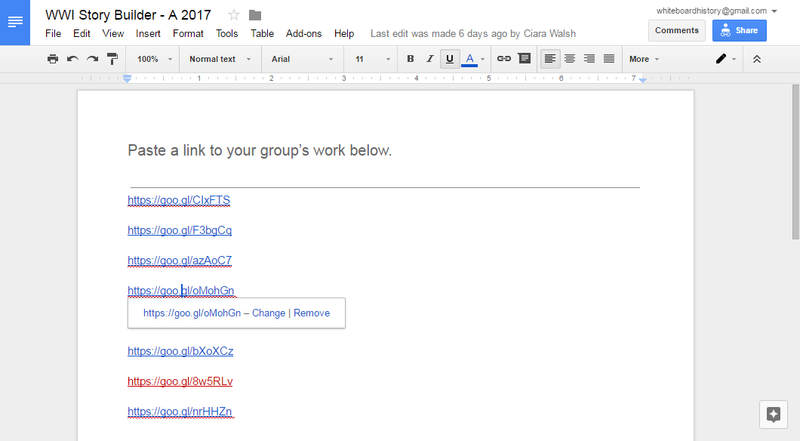 Lastly, from a tech integration point of view, this activity is quick and easy to execute in a Google Apps classroom. I love easy tools that don't require new accounts. Otherwise, the tech can distract from the learning process. Click here (or the image below) to see some of the student work samples. 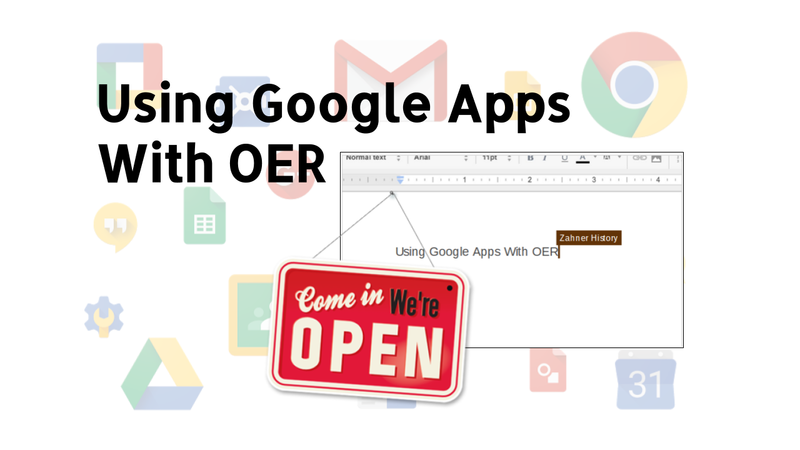 Most Google Apps educators know that Forms works great for collecting almost any kind of information from students, including administering quizzes and collecting open responses. Managing the information, however, is a problem that needs attention. We can automate the grading for multiple choice quizzes, yet constructed responses, like exit tickets, require feedback from the teacher. The problem is getting that feedback to the students. Sure, it can be returned to the students numerous ways, but what if it was always live and the need to return work was eliminated? 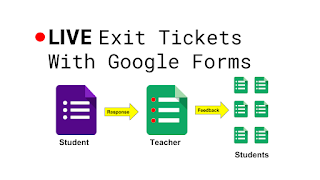 Since Google Classroom added the question tool a couple years ago, I started using it for exit tickets. It works great, but it's also limited in terms of what you can do with the response as a whole. It's hard to identify patterns of strength and weakness over time, which is why I've switched back to using Forms and Sheets. 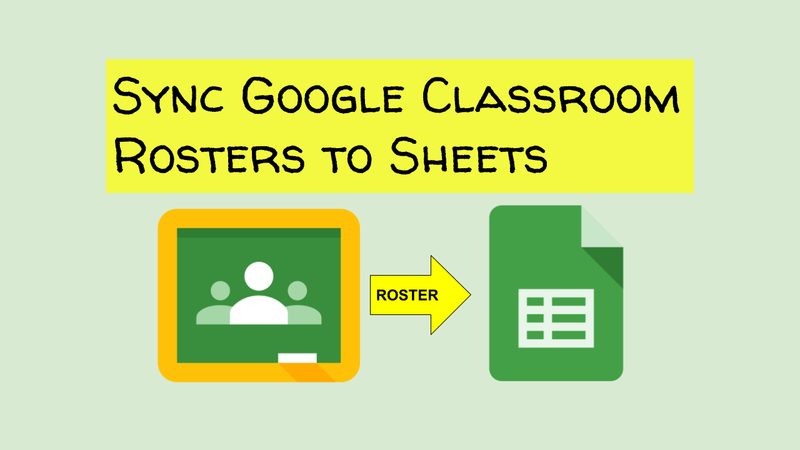 Sheets is still the best solution for so many classroom routines. 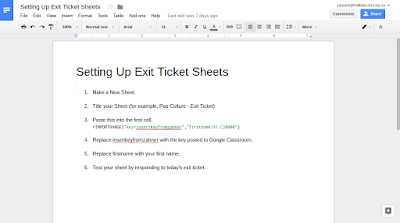 The following explains how I have made exit tickets with Sheets so that the information is live. What do I mean by live? The responses go to a sheet in which feedback is provided. 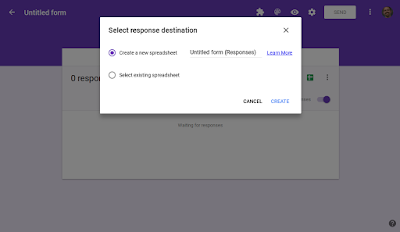 The feedback can be added to the response destination sheet and exported to a student-specific sheet (tab across bottom). The student-specific sheet is synced with a separate document owned by the student. The video below shows how this process works. 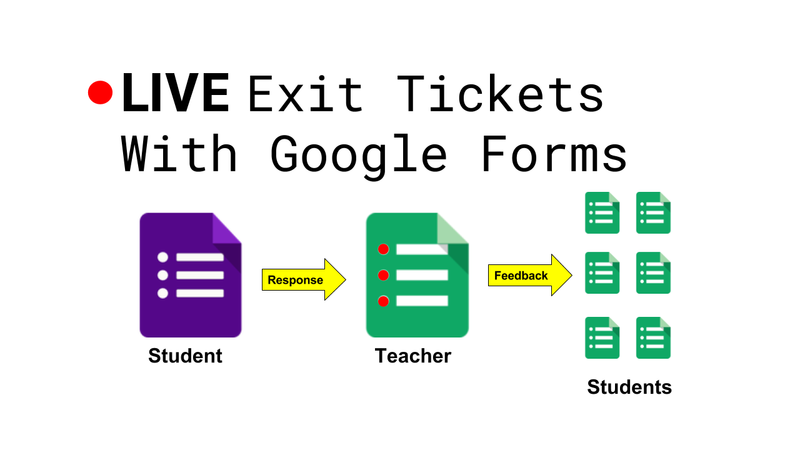 Following the video, I will explain the tools I use to complete the live exit tickets. 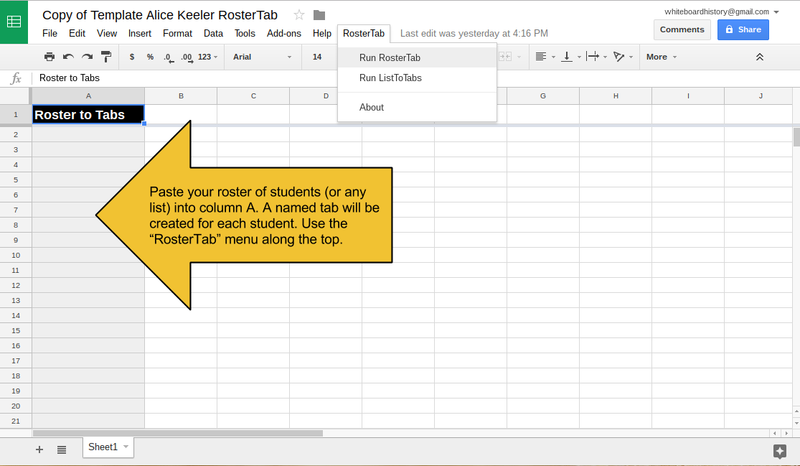 Roster Tab was created by Alice Keeler. She is my first search for anything Google Sheets or Classroom. Open this template (below), make a copy, and title your new document. This sheet will be your response destination (explained in next step). Notice the Roster Tab menu across the top. You'll need it for Step 4 (below). 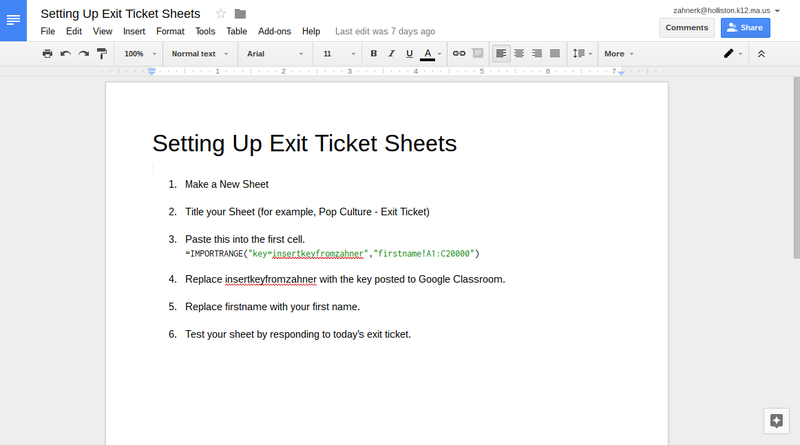 Open the form you use to collect exit ticket responses. Select the responses and click on the Sheets icon. This opens the options shown in the image below. Since the response destination sheet is already created, select an existing sheet. 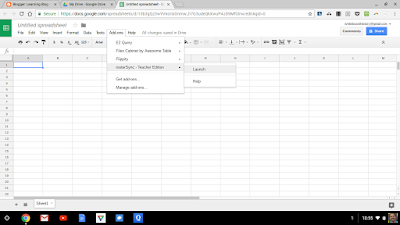 This opens Drive so you can choose the sheet you've created. Open the response destination sheet. In the Add-ons menu across the top, choose get add-ons. 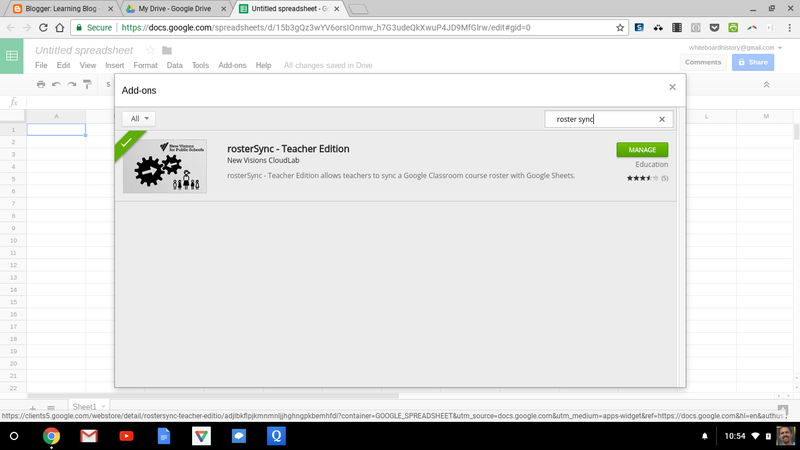 This brings you to a screen that will allow you search for rosterSync, which will allow you to import a roster from Google Classroom. This post explains how to use rosterSync. 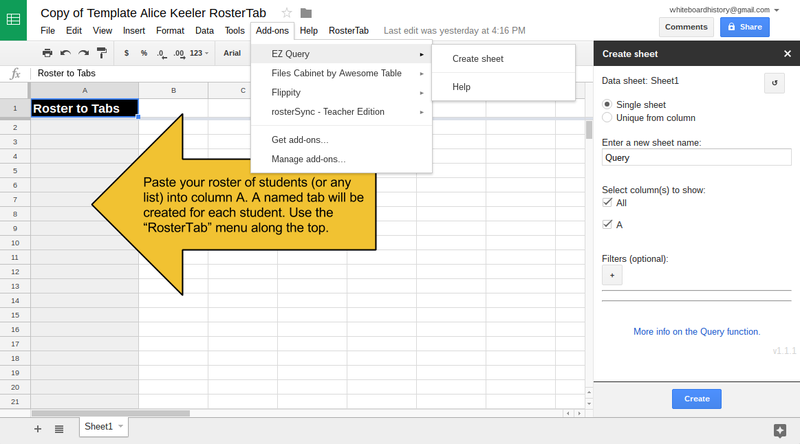 Roster Tab makes a new sheet for each student on the roster. 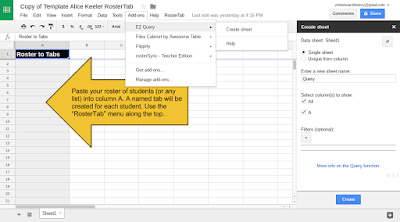 The tabs at the bottom will be used to send the query of response data for each student. I like to use EZ Query because it writes the function for you. You'll have to search for the EZ Query add-on and install it. When it's in your add-ons, run EZ Query to open the side bar shown in the image below. EZ Query is going to make a query function based on the options you select. I like to include the time stamp, response, and feedback columns. The feedback column is something I add to the response destination sheet. Also, make sure you check the range of rows from which the query pulls data. I increase the row number to 10,000 or more rows to accommodate a full course. I provide a set of directions for students because they will only understand how live docs work once they've completed the steps. 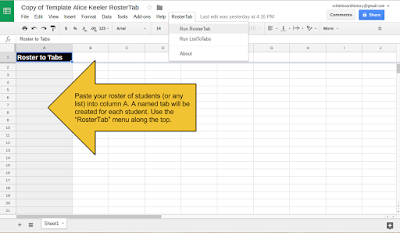 Step three on the student directions for making a sheet includes the function. Students paste the function into cell A1 and change two parts to specify the key and their tab from the mother sheet. 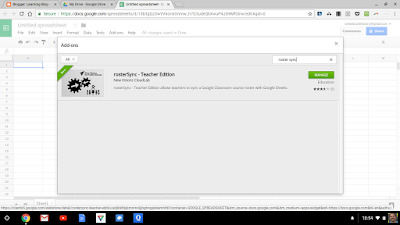 The key is provided on Google Classroom to keep it secure. The feedback is automatically synced to the student sheet, so there is no need to pass back work. Let's say I find myself waiting for an appointment, I can pull out my phone and provide feedback on today's exit ticket. There's no extra steps or complex apps to load. Sheets is simple and reliable. 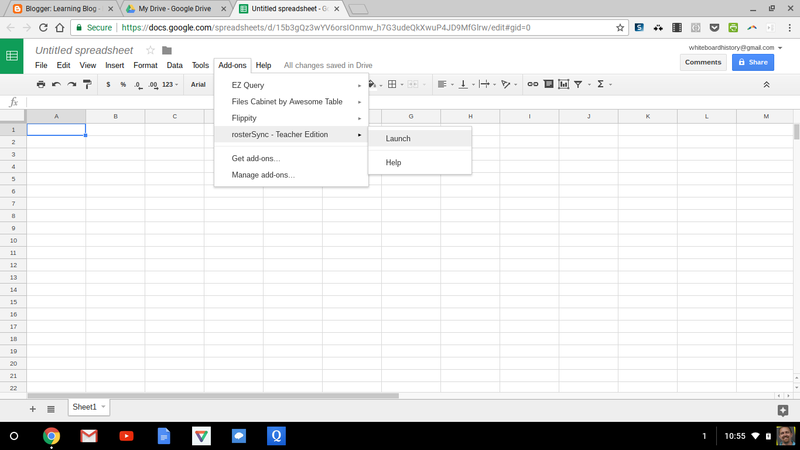 I'm convinced that Google Sheets is the most powerful tool for running a classroom. It's also the safest tool to use and teach because it has a seemingly endless shelf life. When selecting tools to use with my students, I look for ways to reduce time on the busy tasks. After trying this approach for a few years, I've learned that the shiny things aren't always the best for my students. The tools that simplify our workflow often win. 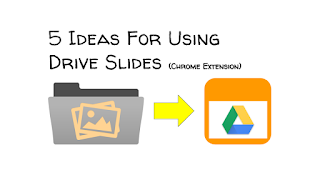 One of my new favorite tools is Drive Slides, an extension by Matt Miller and Alice Keeler. Although it's simple, Drive Slides has so many possibilities. I haven't explored all of the following, but my wheels were burning the first time I tried it. My classroom already uses Drive folders to share work as a class, so an extension that makes a slide presentation from images in a folder hit home for me. For example, my students share image summaries to review and reflect on lessons and units. Now, these images can be in a Slides doc with one click of the extension, and that's just the beginning. I realize that in theory it's not hard to share a slide presentation with my students in which they can add the images and skip the Drive Slides step. The problem is that in practice kids are not all proficient with mobile age technology like so many people claim. Plus, I want my students to focus on the image search to develop Web literacy skills, not making a slide presentation. 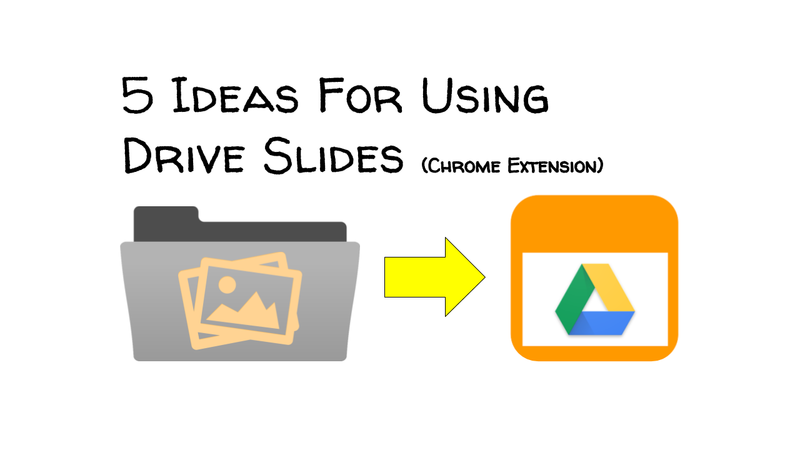 Here are some of my ideas for using Drive Slides. Share a Drive folder via link with editing permissions. 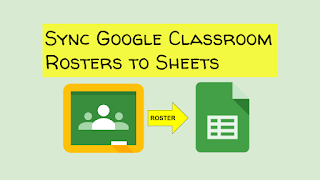 My classes all have a file share folder accessible through the About page on Google Classroom. Students add images based on a prompt, and let Drive Slides do the rest. So many slide presentations have been clipped, and the remains are all over Google Images. Ask students to find slides in image format to construct a quick slide presentation of the best content they can find. The image below is a screenshot of an image search. The images with the red boxes are slides from presentations that have been clipped. Take photos of paper-based work or screenshots of digital work to upload to a Drive folder. The extension saves a lot of time form fumbling with technology when the purpose of the activity is for students to practice presenting their work. I particularly like this approach to sharing work because it allows my students to learn to focus on the evidence of their learning. After they work on a 10- to 15-minute activity, it's important that they know whether they met the expectation or not. Flipping through a handful of slides is a great way to support the need for feedback. Slides Q&A was made to allow the audience to ask questions during a presentation without disrupting the presenter. It can also be used to gather questions as the primary focus of the lesson. Display an image on your swiftly made Slides doc, and instruct students to respond based on a thinking routine. Then, ask them to vote up the most helpful responses to the discussion. The images can be contributed by students like in the first item on this list. Whether the lab is done on paper or not, images of the results or process can be uploaded to a folder. Once the Slides doc is made, the presenter notes provide a space for description of methodology, observations, and conclusions. Take advantage of the print options such as printing one slide per page with speaker notes. It would be interesting to compare long term power outages in New York to market data – start with catastrophic storms that cause outages. My hypothesis leads me to believe that with less access to data and communication among stakeholders, the market values would rise and potentially become more indicative of the actual value of the goods and services. Information can be both useful and damaging. It depends on what we do with it. How much is enough? How often is enough? I don't think answers to these questions have common ground among individuals, but these are the kinds of questions we ought to be asking. We need to correct the over swing of the technology pendulum in education and promote a philosophy that safeguards users. The future of our society's youth is at stake, and I'd like to start with mobile devices and online grade books. Online grade books are abused. As a parent of public school students for nine years, I can say with pride that I have never looked at an online grade book for any of my children. I guess dealing with it as a teacher has shown me how much it doesn't say about achievement – a topic for another post. The grade conversation with my parents worked fine for me every nine weeks, and it has worked just as well with my own kids. The difference in our house is that our kids are expected to tell us about specific challenges and their plans to overcome them. I guess my parents did that, only with less insider knowledge. I'm just glad they didn't hover. I would have hated learning, and they probably knew that about me. Grade books serve a purpose, in theory. In practice, most teachers are battered by emails because a test grade isn't showing up quick enough. Sometimes the job is a beating and grades aren't done right away. The on-demand expectations of the Netflix-watching students and online-banking parents are a bit much. We need to establish norms grade books and many other applications in the mobile age, including the mobile devices themselves. Steve Jobs and his family had different technology use expectations than many families. Their kids only had screen time on the weekends, with limited use. My wife and I have adopted this approach with much success overcoming a wide range of behavioral issues. On the other hand, my kids learn the alphabet at about three years old with songs, refrigerator magnets, cartoons, the Letter People (on YouTube), and typing searches on Google Images. It's all about balance, and at the younger ages, more low-tech than hi-tech works with the right activities. In the classroom, I try to design activities that focus on making a product that we can use and discuss face-to-face. In fact, long term papers are not my favorite because it's too much on the eyes and emotions of young learners. They need to be challenged with long term projects but not at the expense of their health. We focus on shorter tasks that take about 20 minutes of screen time (often less) and experience the reward of sharing individual responses to problems as a group. The balance between listening, speaking, reading, and writing is still very important, especially with the potential of extended screen time in 21st Century classrooms. Alan November is a proponent of Web literacy. He believes this is more important than giving every kid a device. We know that he's on the right track through examples like the hole in the wall in India. A device in every learner's hands is important but not crucial to becoming Web literate. I particularly like Alan's idea about 1:1. He doesn't think that it's bad to give every student a device. He thinks it's wrong to view the relationship between the child and the device as important. The ratio he's more concerned about is the child to the world – one:World, not 1:1. As the popular conclusion in education goes, it's all about the mindset. With technology changing so fast, it's hard to know what will lead to positive results. One thing I've noticed in my own choices is a return to the fundamental tools as new tools do too much for me. For example, instead of paying for a tool that automates emails, I use sheets and scripts to do it for free. It only takes an hour to set it up using tutorials, and I got to learn some Java script. Another drawback of the virtual world is the lack of paper weighing us down. The physical acts of managing paper establishes and intimate connection with the type and amount of work we need to complete. Kids won't be going home with heavy backpacks when their Chromebook never changes weight no matter how much information is stored. Kids need new organizational strategies. They need to learn the basics managing digital files in the cloud. most of our education and professional life exists online. This comes with consequences if we don't teach the risks and benefits. The trouble is not enough educators know what those consequences look like. Some educators don't view students lacking the concept of cloud file sharing and organization as an organizational issue. Those people will suffer in the connected world. Perhaps they already do. As we transition further into the mobile age of the Internet, the things that work will not throw away all of the values we gained from the ways we once worked. We still need the time to contemplate that we once enjoyed on a walk to the library. We still need to rest our eyes from the stress of focusing and refocusing. What works is what helps us sustain a level of productivity without losing our health and well being. If technology compromises those essentials, the pendulum has swung too far.